Healthcare printing can be very complex. The focus of IT and operations is to provide a simple, efficient, cost-effective and secure printing environment for healthcare industry users (nurses, doctors, and administration) to improve access to information which supports the delivery of better healthcare with reduced patient wait times. Printing technology downtime in the healthcare industry is not only an issue for wait times; in critical care areas, it can cost precious moments that could make the difference between life and death. For this reason, it’s crucial to provide high uptime with an efficient platform of printing and imaging equipment and integrated software. Partnering with independent MPS experts with deep knowledge of hospital printing and imaging environments is critical to the success of the healthcare organization’s goals: simple, efficient, secure and cost effective. However, if printing solutions are not implemented correctly to provide users with simple, effective and stable workflows, users will revert to manual processes and lose efficiency. At SmartPrint, we are experts at getting healthcare printing right for each individual department. We provide simple secure printing solutions to get the job done while leveraging those same platforms to provide the departments with more complex workflows and processes which support higher levels of efficiency gains. As MPS experts, we have vast experience across many industries, particularly managed print services for printing in hospital and healthcare environments. We understand the healthcare industry’s challenges and opportunities to improve their printing and imaging environments. Find out more about our expertise in the healthcare environment by downloading the Oakville Hospital Case Study. Document control supporting patient record and information security. In most healthcare organizations, 25% to 50% of help desk calls are printer related. Highly decentralized departments with individual budgets and procurement. A mixed platform of devices which creates a complex environment for IT to manage, dramatically impacting ease of use and inability to implement stable workflow solutions. Management of multiple vendor relationships impacts procurement time dramatically and increases complexity for help desk management. No ability to pro-actively manage printing devices – Decentralized printing environment combined with the need for confidential printing often drives an unnecessary increase in locally connected print devices that result in high costs and limited visibility. Implementing secure, simple mobile printing in the hospital environment is critical but challenging. Lack of capability to track and report for audit purposes. Security, printing and imaging devices on the network that are not locked down and protected from potential hackers. Most of the units have web services and hard drives and can be open access points for intrusion. Pro-active management of all healthcare printing devices supporting required brands. A security audit of the printing and imaging environment to identify risk areas. Reduction of risk by securing the printing and imaging environment through document control software and security software that locks down the devices to thwart hackers. Management reporting to provide visibility into downtime issues and costs – simple yet detailed reporting for allocation of costs across departments. Additional management reporting to provide supporting data to drive continuous improvement for the hospital printing environment. Significant reduction in IT project and help desk time, enabling focus on core competences. Moving to a single print vendor results in the reduction in monthly purchasing transactions and associated administration – from potentially thousands per month to one single invoice for all printing and imaging requirements. Fax over IP to help reduce costs ( printing / phone lines / security). Increased efficiency through automated workflow solutions that capture, route and process documents with one touch of a button and can be customized right down to the user level. At SmartPrint, we have deep experience and knowledge of what it takes to support hospitals and other healthcare organizations. 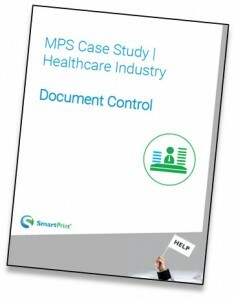 Contact SmartPrint to discuss how our MPS solutions and content management workflow can dramatically improve efficiency and security in the healthcare industry. Complete the form below for your no obligation print assessment to see how managed print services for the healthcare industry might improve your print environment.